Every December, when people are looking for ways to evoke that holiday spirit, many families pile up in cars and drive to their favorite Bay Area neighborhood, famous for over-the-top displays. Or they traipse to Union Square together, to check out the huge windows at Macy’s, Saks 5th Avenue, and Neiman Marcus, where some, like Carl Nolte of the San Francisco Chronicle, fondly remember the store when it was the City of Paris. So here is a novel idea if you are searching for some holiday glam, away from the crowds. Come to the Financial District, where many skyscrapers are decked out in their red and gold finest, and glimpse the city’s smorgasbord of architectural styles. 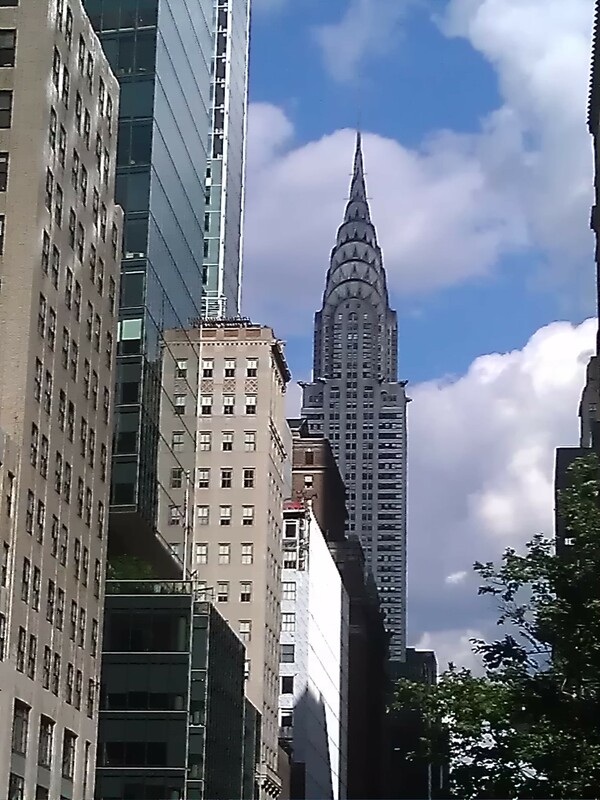 Of course, here at the Timothy Pflueger blog, I am partial to the skyscrapers of the Jazz Age. But there is holiday spirit everywhere you turn. Try and catch some of these decorations before they are put away in storage at the dawn of the new decade. A fun place to start, where many come to take photos, is the plaza in front of the tower simply known as 101 California. 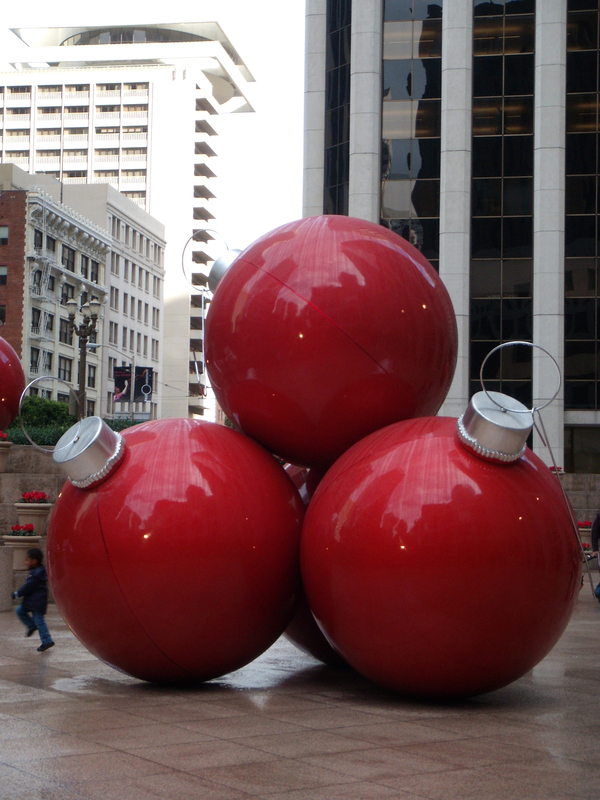 The plaza is currently dominated by giant red steel Christmas tree ornaments. You will feel like a Lilliputian next to these giants, which are nicely accented by an array of potted red Cyclamen. There are two big block of concrete steps in the plaza (like a ziggurat!) to relax or watch seagulls bathe in the nearby fountain. 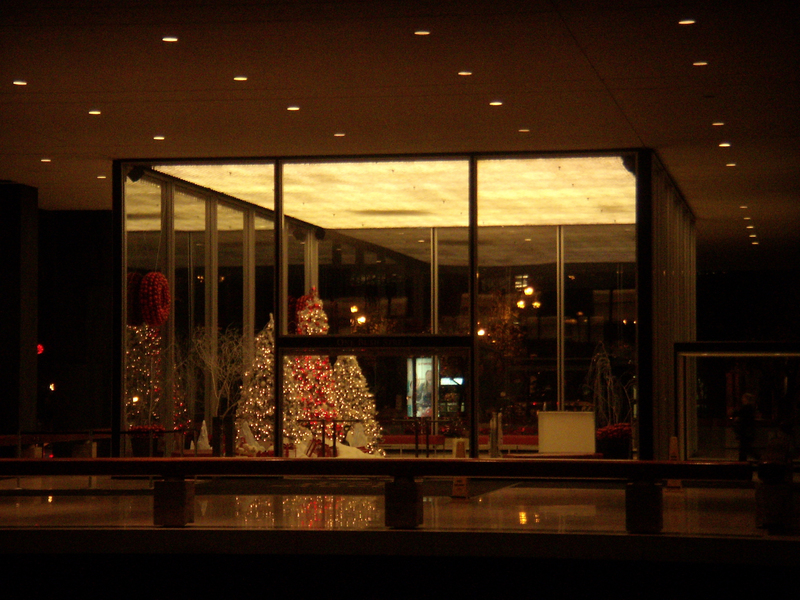 Inside, the lobby of the cylindrical 48-story tower, completed in 1982 and designed by architects Philip Johnson and John Burgee, has more grandiose decor. Enormous ornaments hang from the ceiling. Continue down California, then turn left onto Battery Street, until you reach the corner of Battery and Bush, and cross the street to SOM’s Crown Zellerbach Building, the city’s first International style building. Completed in 1959, it is one of the finest examples of mid-century modern design in the city, inspired by Mies van der Rohe. Walk down Bush Street one block. Turn left onto Sansome and cross the street. If you are walking during regular business hours, you can enter the courtyard that serves as the conservatory adjacent to the bland skyscraper at One Sansome Street. The conservatory is the former site of a bank designed by my favorite Beaux-Arts architect, Albert Pissis. The lovely marble-enclosed conservatory was originally the Anglo and London Paris National Bank, which occupied the site from 1910-1981. 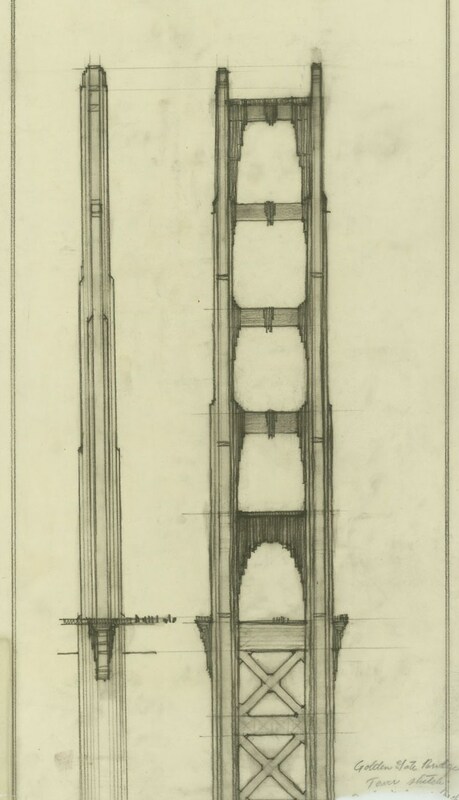 Pissis, a San Francisco architect who was born in Mexico to a French father and a Mexican mother, grew up mostly in San Francisco, with an interlude at the Ecole des Beaux-Arts in Paris in the 1870s. Pissis is known for his early embrace of the Neoclassic, as one can see from the preserved marble arches and ornate cornice. Some of his best-known buildings are the Hibernia Bank on Jones Street, the Flood Building on Market and Powell, and the former Emporium, now San Francisco Centre, just across Market Street from the Flood Building. Turn around and continue on Sansome Street and head to the former Pacific Stock Exchange building at the corner of Sansome and Pine (an amusing footnote, in the financial pages of the Chronicle for years, a byline on the daily markets wrap-up story was Sansome Pine). 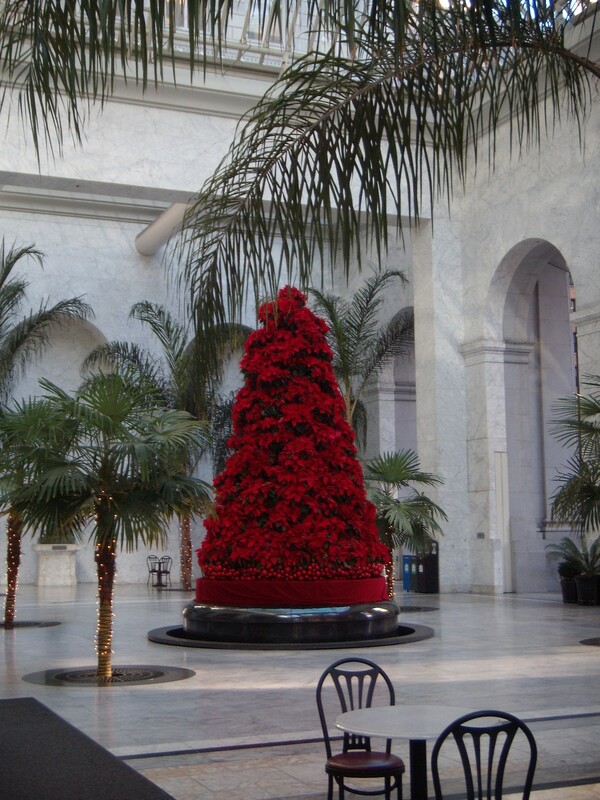 There is usually a friendly guard sitting at the information desk (except on Sundays) in the lobby of 155 Sansome Street, who won’t mind if you peak at the tree and the gorgeous lobby. 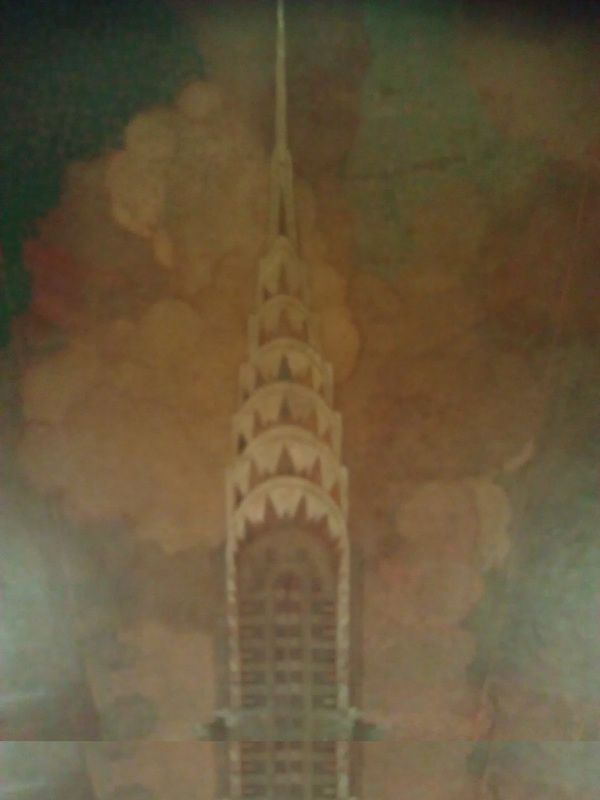 If you cannot get inside, you can also gaze at the streamlined design of Miller & Pflueger’s tower, completed in 1929 just after the great stock market crash. The massive sculptures that adorn both the facade of 155 Sansome and the Stock Exchange trading building on Pine were done by local artist Ralph Stackpole and you can see the influence of his friend, muralist Diego Rivera, who painted a stunning mural inside at the City Club, the former luncheon club for traders and brokers. 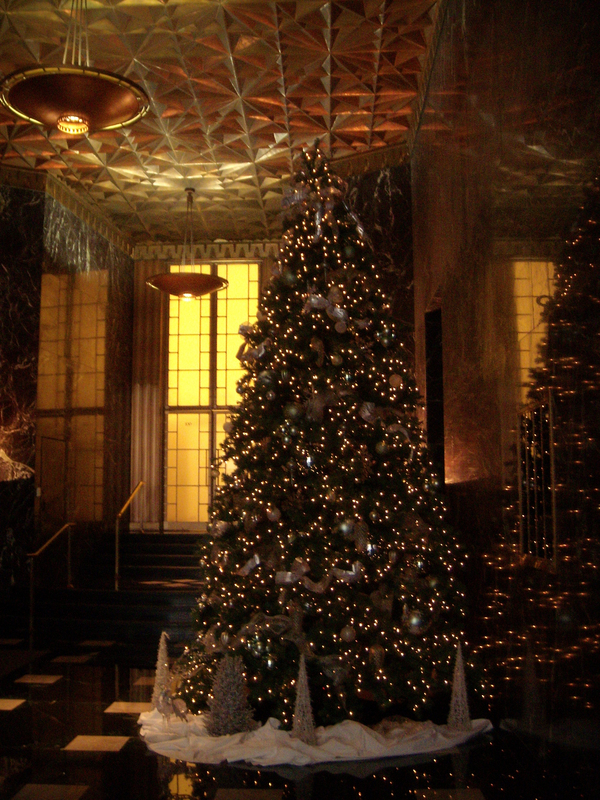 Inside, gold tones in the lobby compliment the brightly lit tree and shimmer in the reflection of the dark marble walls. The star-patterned ceiling was inspired by a Berlin nightclub. Continue down Sansome until you hit California Street again, turn left, and look for the brightly colored columns of the Merchants Exchange Building, designed in 1904 by famed Chicago architect Daniel Burnham, with Willis Polk, one of the city’s more eccentric architects, best known for his daring design of the Hallidie Building at 130 Sutter and its innovative glass curtain wall. Continue along California Street and turn left onto Montgomery, you will see the heavy massing of the Russ Building at 235 Montgomery Street, which was for many years the tallest skyscraper in San Francisco, after its completion in 1927. It stole the crown in height from Miller & Pflueger and Cantin’s Telephone Building. Its Neogothic detailing makes one think of a cathedral and the lobby is especially church-like, a veritable temple to finance. 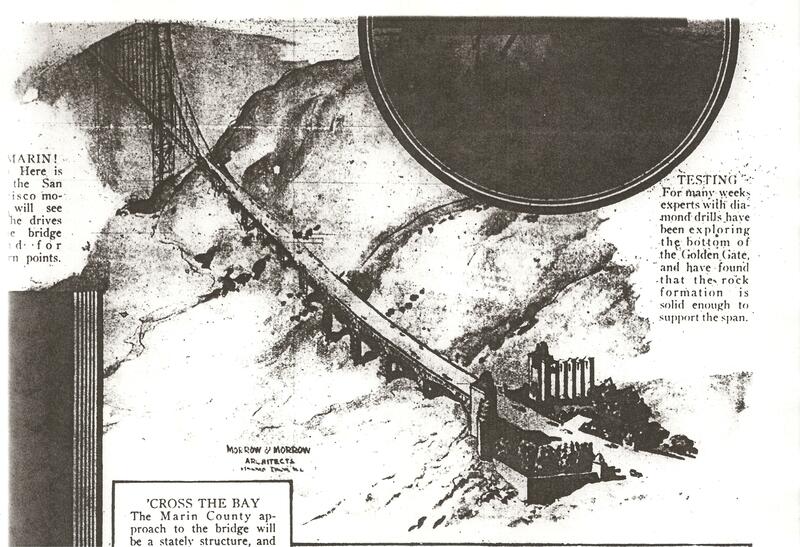 It was commissioned by two investment banking firms during the roaring 1920s stock market boom. 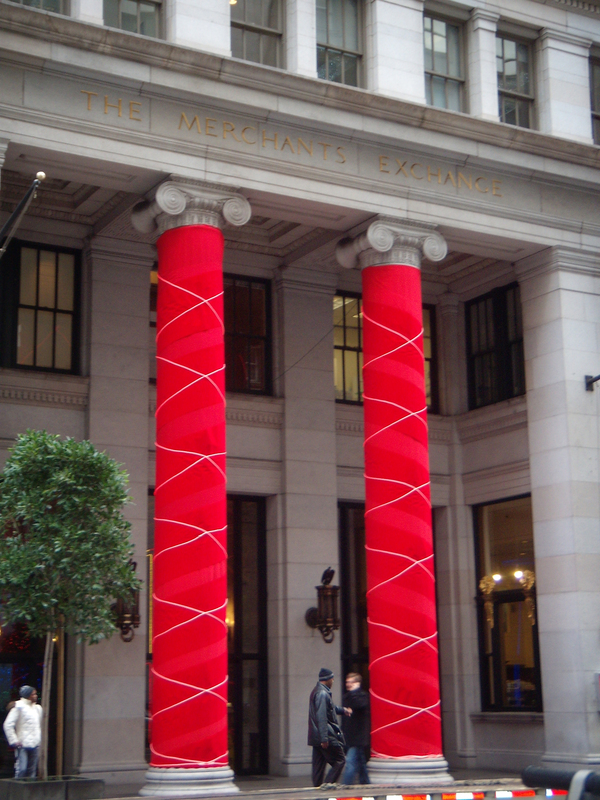 After admiring how the terracotta facing and detailing is highlighted by the red holiday swags and greenery, continue down Montgomery Street, also known as Wall Street West (even though the Stock Exchange was located on Pine Street). Continue until you hit Sutter Street, and at Sutter and Montgomery, you will find the office building where Dashiell Hammett’s best known detective, Sam Spade, had his office. 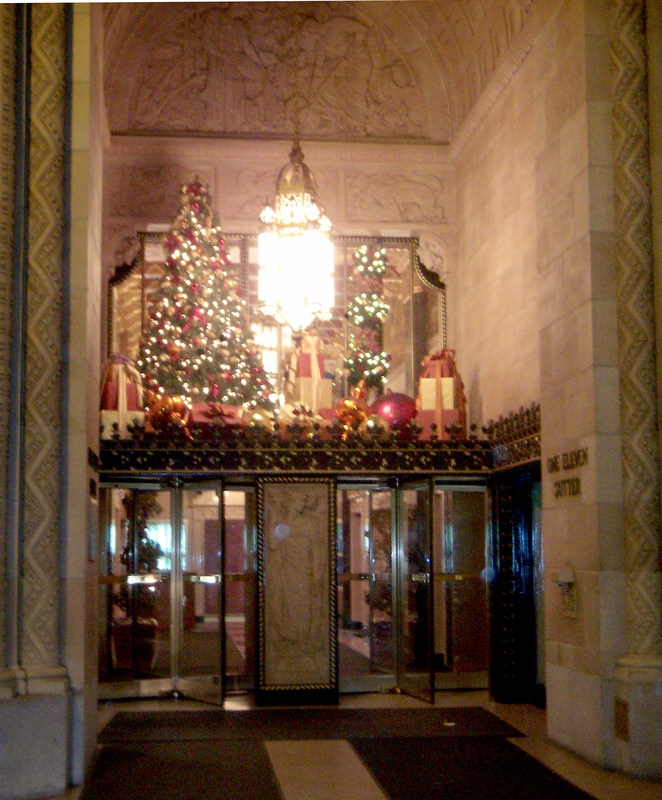 It has been calculated by Hammett fans, including Don Herron, the creator of the Dashiell Hammett walking tour, that Sam Spade, the detective in The Maltese Falcon, had his office in the Hunter-Dulin, completed in 1926 by New York architects Schultze & Weaver, known for their beloved Waldorf-Astoria Hotel. While not Deco or Moderne in style, the Hunter-Dulin Building is reminiscent of a French chateau. Its unusual copper mansard roof can be seen as you hike up Sutter Street. 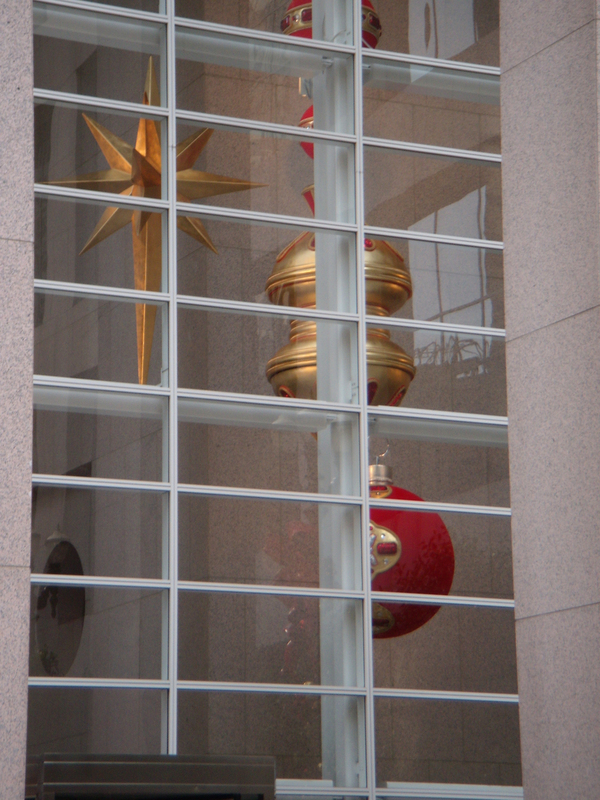 Notice the ornament course at eye level and you will see a bird. A falcon perhaps? Well not likely, since the building was complete before the black bird’s infamous moments in literature. But it’s fun to pretend. Turn left at the Hunter-Dulin Building, and head up Sutter Street, just as Spade turned toward Kearny on the prowl for some tobacco. There is a slight incline and as you walk west, you can see the tower of 450 Sutter, its terracotta ornament recently cleaned and new windows installed. The interior is like stepping into a temple of the Maya, with its stepped ceiling in the shape of a ziggurat. The gold and green holiday decorations contrast with the dark Levanto marble and echo the gold, bronze and silver tones of the extensive metal work, which evoke Mayan figures, in the stunning lobby. 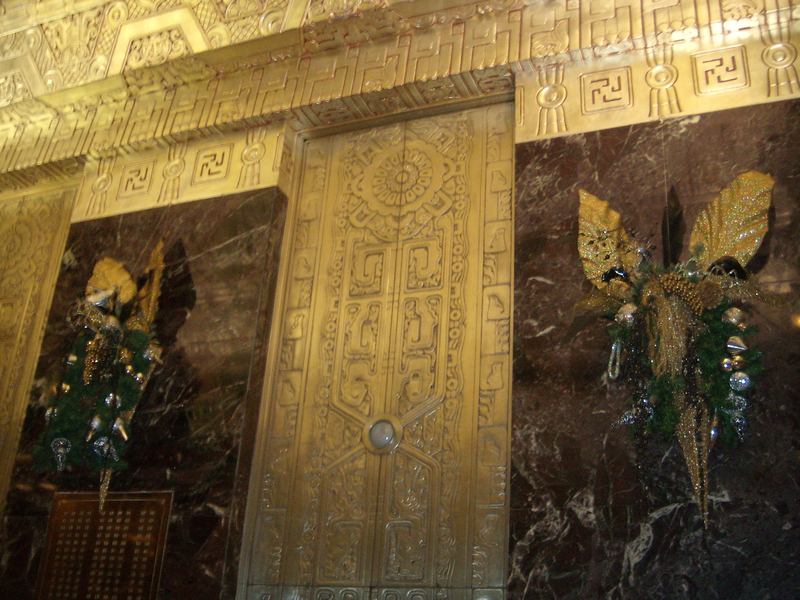 Last week, I went to the dentist at 450 Sutter, Miller & Pflueger’s ode to the Maya. While I was there, the pleasant security guards (among the nicest in San Francisco) were changing the notices in the elevator, where management updates tenants about the building’s ongoing restoration project. The guard let me keep last week’s notice. 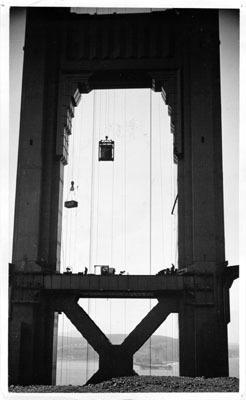 In its place was a reminder that the gorgeous skyscraper had just turned 80 (silly me I totally forgot, even though the building’s opening date, October 15, 1929, is in my book about Pflueger, Art Deco San Francisco). At 80 years old, 450 Sutter is looking pretty fabulous. While the old girl was gifted with a gorgeous bone structure, her appearance was enhanced by a major facelift. Over the past 2-1/2 years, Harsch Investment Properties, the owners, managed a huge project that involved replacing every window in the building and a serious cleaning and repairing of the terra cotta surface. Mackewicz, a vice president at Harsch, was happy to report that 2860 out of the 2862 new windows installed at 450 Sutter passed the test. Only two windows had some very minor water leaks, resulting in a little puddle on the window sills. The last remaining temporary scaffolding will stay up at 450 Sutter while the final terra cotta work is done at the front of the building. Chad Miller, office manager at 450, said the scaffolding and swing equipment for the window work should come down by mid-November, but that could change, based on weather conditions, etc. Kudos to Harsch for its caring stewardship of this icon. What a grand way to celebrate 450 Sutter at 80. You go girl! Just two blocks down the street from 450 Sutter, one can quickly compare how modern that skyscraper was for its time. 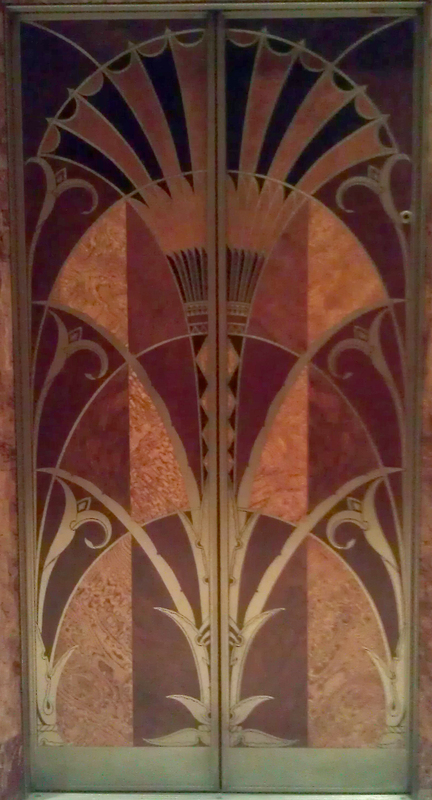 While giving the San Francisco City Guides Downtown Deco tour last weekend, someone in my group pointed out the stunning floral ornament at the cornice of this lovely retail building at 250 Sutter. This small six-story building was built in 1909 and designed by the local architectural firm of Meyers and Ward. It was originally called the Goldberg Bowen building, for the delicatessen at the ground level. 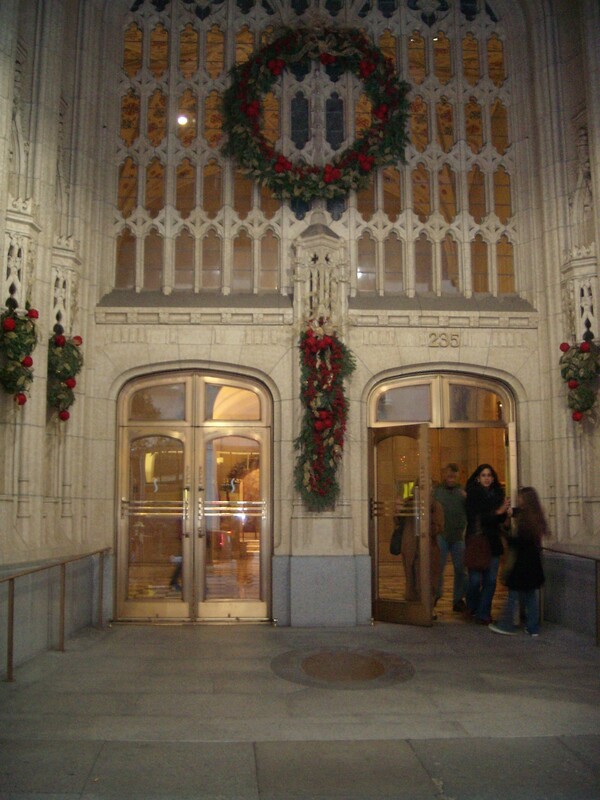 The building’s cornice and organic, Art Nouveau-like ornament, are of terra cotta as well, and are an interesting contrast with the neo-Gothic ribbing and arches.